Jackson Hole, WY is one of the rowdiest ski scenes in North America. 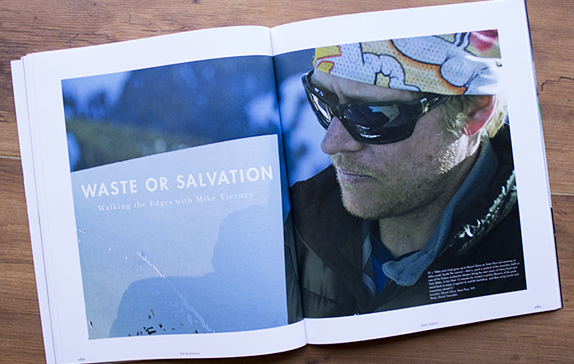 So when Mike Tierney moved to Jackson in 1999 and knocked off multiple unskied lines in full view of the resort, it quickly earned him a reputation. But soon Tierney distinguished himself in a different realm, with an artistic ability to capture the power of the mountains and to depict the kinds of lines appreciated by many but conquered by few. One foot on the ladder, the other suspended in air, Mike Tierney is debating a more detailed explanation of his impending, brusque departure. “I have to do this one thing. I’ll be back in 20 minutes,” he says, leaning over the void. “To paint them?” I ask. He’s been making ski art for Igneous for years, so skateboard art for their longboards makes sense.